Find hotel near Church Of Our Lady Of Mou .. Built on a beautiful slope, this is a catholic church and is one of the oldest structures in Cameron Highlands. Built around 1930, the Church of Our Lady of Mount Carmel offers a place for worship for those who are looking for spiritual or religious sessions. Set against the alluring backdrop of valleys, this church offers you an ideal blend of nature and religion. Ever since its construction, this church has become one of the prominent places of worship in Cameron and is thus a landmark to be visited. For mass timings, refer the website. 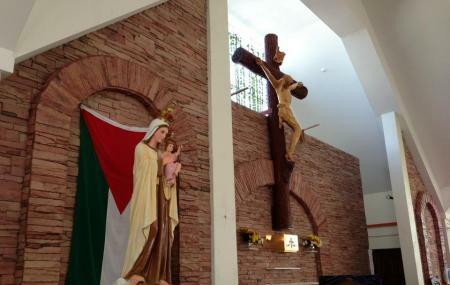 How popular is Church Of Our Lady Of Mount Carmel? People normally club together Thompson Falls and Cameron Bharat Tea Estate while planning their visit to Church Of Our Lady Of Mount Carmel. People also prefer to start their day with Church Of Our Lady Of Mount Carmel.